SSH, (or Secure Shell), is a cryptographic network protocol used to secure network connections over an unsecured network. To use SSH, you must use an SSH client to connect to the server. Once connected, you can manually run commands within a terminal application. All connections within your SSH client travel over a secured connection, rather than plain text. Because of this, the connection is encrypted and secure. One of the biggest drawbacks about FTP is that you cannot run specific commands to accomplish a specific task. With FTP, you can upload/download files and directories. You can rename them as well, but you cannot run a command that 'does' anything. These tools can make it much easier to troubleshoot and manage your website. However, SSH can be difficult to use for new users, so some knowledge of the UNIX Shell is highly recommended. Should I use SSH or FTP? SSH can do everything FTP can, however it's more difficult to use and isn't recommended for beginners. If you're making simple adjustments to your website such as uploading/download files, FTP is the easiest choice. If you need to run specific commands, SSH is needed. This Shell user is the username you use to log into your server as shown below. Once you have chosen a terminal, open it to view a blank screen. Here you can enter a command to log into your server. When you're ready to log into your server via SSH, you'll need to know your hostname. This can differ depending on which type of server you're site is on. 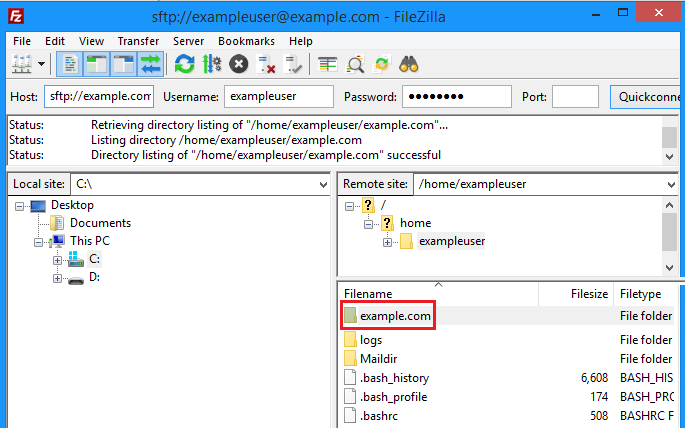 View the 'Finding your server name' article for details on how to obtain the correct name. The table below can also be used to locate your hostname. example.com You can use this if you're logging into a specific website. Just change 'example.com' to your actual domain name. Your site must be hosted at DreamHost for this to work. This article uses server.dreamhost.com as a general example. Make sure to use the correct server name for your particular site or server. Be sure to change example.com to your actual domain, or server.dreamhost.com to the server you're connecting to. You can then asked for your Shell user's password. Enter this and you'll be logged in. Once you set up a shell user, you must enter your password each time when logging into the server. If you’d like to avoid entering your password each time, you can set up Passwordless Login. This way, you'll be able to automatically log in each time without needing to enter your password. How do I configure PuTTY? How do I set up passwordless login in PuTTY? Article last updated April 11, 2019 16:52 PST.